A, 55-year-old woman who underwent superficial parotidectomy 22 years before recurrence. Axial fat-suppressed T2-weighted MR image demonstrates marked T2 hyperintensity of multiple recurrent pleomorphic adenoma lesions on the right. Subcutaneous location of lesions is also noted on this image (arrows). 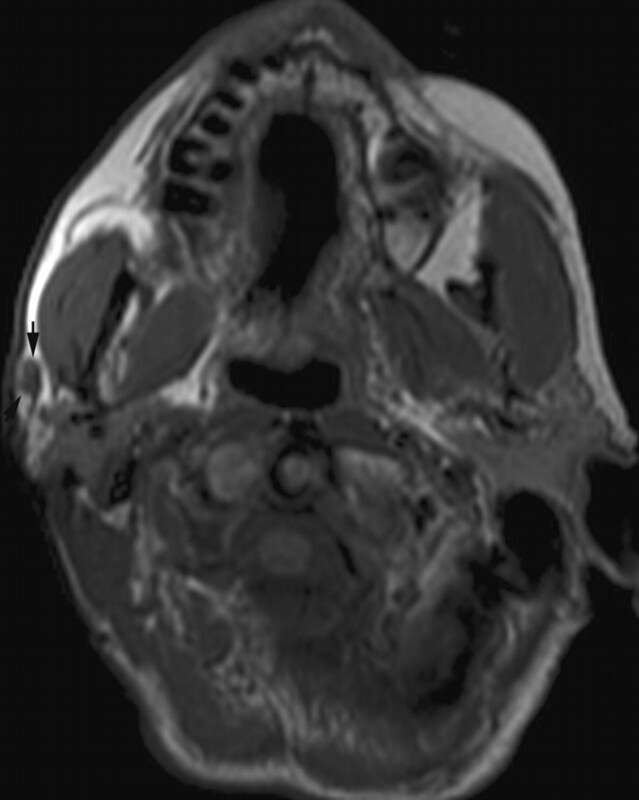 B, Also noted are multiple T2 hyperintense recurrent lesions at the right stylomastoid foramen (white arrow), the right parapharyngeal space (asterisk), and the superficial parotidectomy bed on this axial fat-suppressed T2-weighted MR image. A 40-year-old man with near-total right parotidectomy performed 34 years previously. There is marked T2 hyperintensity in a tiny recurrent pleomorphic adenoma lesion (arrow). 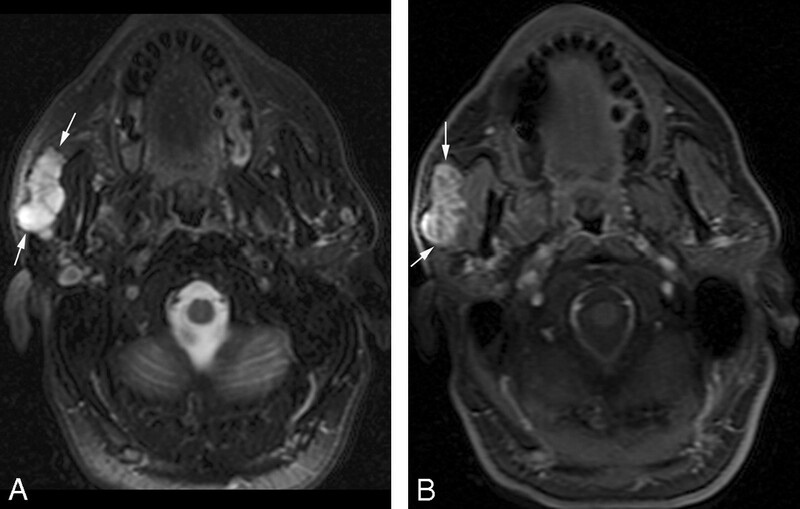 A 47-year-old woman 8 years after superficial parotidectomy. 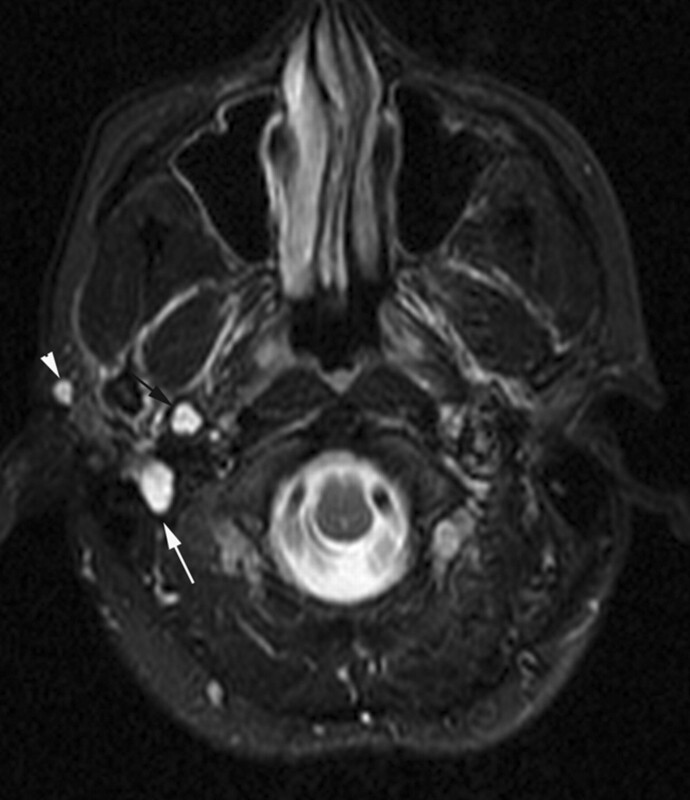 Axial gadolinium-enhanced fat-suppressed T1-weighted image through the neck shows rim enhancement of the recurrent nodule in the left superficial parotidectomy bed (arrows). The small enhancing structure anterior to the nodule is a vein (black arrow). A 55-year-old man with recurrence 35 years after initial surgery. 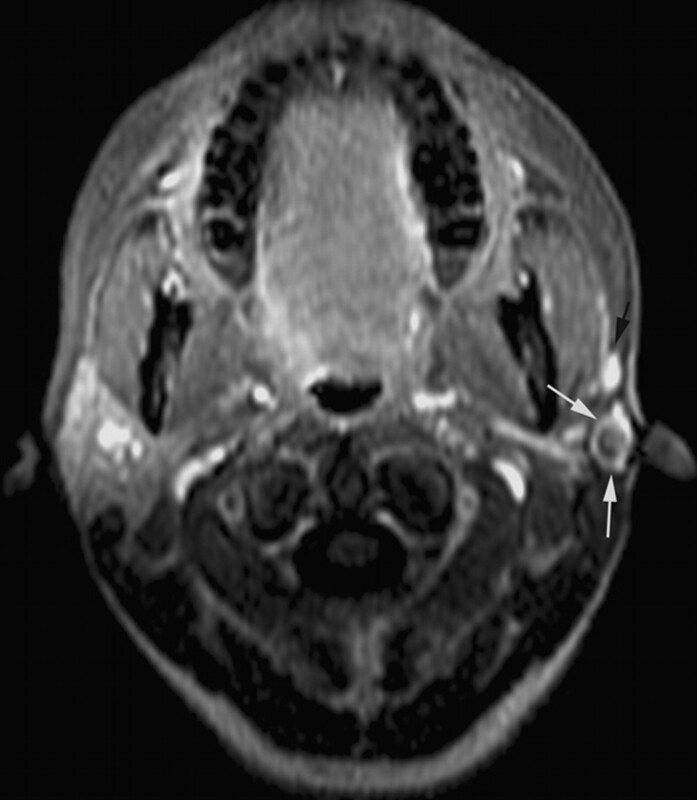 A, Axial T2-weighted fat-suppressed image demonstrates a multiloculated T2 hyperintense mass superficial to the right masseter muscle (arrows). B, There is a heterogeneous enhancement pattern noted on the postgadolinium image (arrows). A 58-year-old woman who presented with recurrence 40 years after surgery. 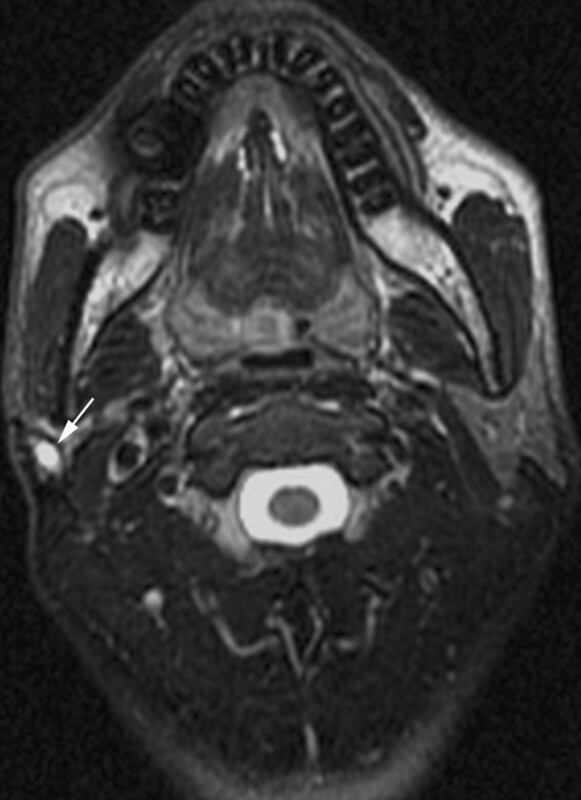 Axial T1-weighted MR image through the neck demonstrates a tiny nodule in the subcutaneous fat overlying the right parotid surgical bed (arrows). A 29-year-old woman 10 months after superficial parotidectomy. 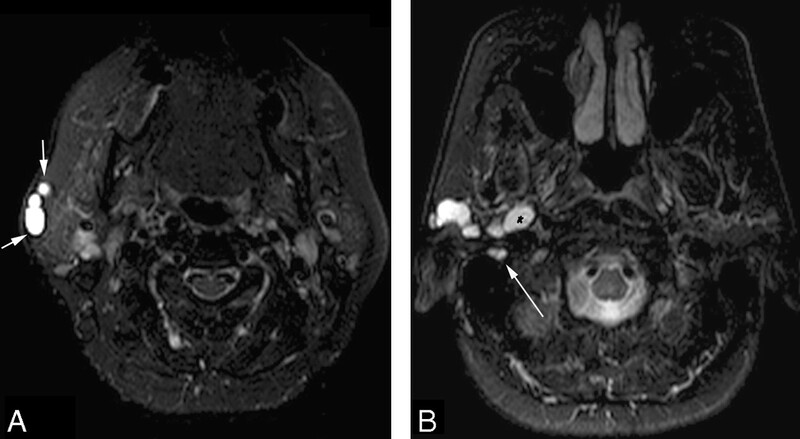 Axial fat-suppressed T2-weighted MR image demonstrates T2 hyperintense recurrent lesions in the right parapharyngeal space (black arrow), in the stylomastoid foramen (white arrow), and in the subcutaneous tissue anteriorly (white arrowhead). Note:—T2 HI indicates T2 hyperintense relative to the normal parotid; op bed, indicates operative bed; postgad, postgadolinium.